This article is devoted to the irreplaceable assistants in our life - electronic calculators. The history of originating of the Soviet calculators, their features and interesting possibilities of separate models is described. The first mechanical fitting in Russia for automation of accounts were abacuses. This "the national calculator" has held on workstations of the cashiers in shops down to middle of the ninetieth years. It is interesting to mark, that in the textbook "Trade calculations" (1986) the whole chapter is devoted to methods of calculation on the abacuses. Abacuses represent the wooden basis, on which the metal rods are hardened, on which the wooden beads are strung. On each rod ten beads are, except for a separator of roubles and copecks, on which four beads are. Before the beginning of calculations all beads are moved on the right side, as shown in a figure. Input of number start from the most significant digits of roubles, removing necessary quantity of beads by the right hand. Abacuses are intended for addition and subtraction, and at the defined skill the speed of execution of calculations can exceed speed of execution of the same calculations, but with usage of the calculator. Simultaneously with abacuses, in scientific circles, still with pre-revolutionary (before 1917) times, with success used slide rules, which with XVII of century practically without changes worked down to appearance of calculators. The collecting of slide rules - too very fascinating hobby, to which can be devoted separate article. Trying how to automize the process of calculations, the mankind starts to devise mechanical counting devices. 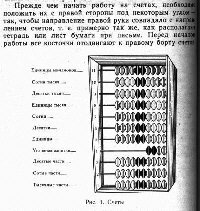 Even known Russian mathematician the Chebyshev in the end XIX of century has offered the model of the calculator. The most popular mechanical calculator in the Soviet times was the adding machine of the system Odhner "Felix". At the left - map of an adding machine taken from the "Small Soviet encyclopedia" of 1932. On this adding machine it was possible to manufacture four arithmetic operations - addition, subtraction, multiplying and division. In later models, for example, "Felix-М", it is possible to see toddlers for the indicating of a rule of a comma and more convenient crandle for shift of the carriage. For production of calculations it was necessary to turn a pen - once for addition or subtraction, and some times for multiplying and division. Once, certainly to twist a pen it is possible, and even it is interesting, but what to do, if you work the bookkeeper, and for day it is necessary to perform hundreds simple operations? And the noise from twisting counters stands decent, especially, if simultaneously in a location with adding machines some man works. However, in due course to twist a pen has bothered, and the human mind(wit) has struck out electrical accounting machines, which arithmetic operations manufactured automatically or is semi-automatic. On the right - map of the multikeyboard computer, popular per 50 years, VMM-2 ("Goods dictionary", VIII volume, 1960). This model had nine bits and worked up to 17 order. It had overall dimensions 440x330x240 mm and mass in 23 kgs. Per 40 years of a beginning strongly to explicate Elektronika and the first computers - electronic - computer have appeared. To the beginning 60 years between computers and most power counting-keyboard calculators the huge breaking was derivated on many parameters. 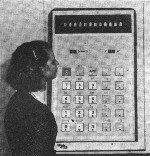 In 1961 at an exhibition of industrial reachings in England first was demonstrated the world's first electronic calculator Anita MK-8 (England). On ending an exhibition it is accepted decision to create domestic, completely electronic calculator. 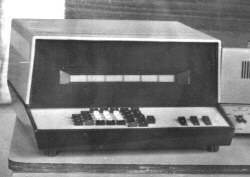 Since 1961 a group of the scientific employees of the "Leningrad separation of Central economic-mathematical institute of an Academy of sciences USSR" are V. Marakhovsky, E. Kanevsky, G. Menderskaya, have begun to develop the first Soviet electronic calculator, which has received a name "Vega". In November, 1962 the calculator has works. On trials of a State commission were represented three created simultaneously calculators under names "Vega", "Lada" and "Vyatka-E". On the carried out(spent) trials has won "Vega", which was decided to manufacture. On the created calculator by group of the developers the copyright Certificate with priority on May 9, 1963 was obtained. To manufacture the calculator began a Kursk Factory of accounting Machines (Schetmasch), which has placed on front The panel of the calculator the emblem K3CM (cyrillic symbols). The electronic keyboard computing machine (EKVM) "Vega" was serially released since 1964 and is intended for mass usage at nonproduction accounts. The calculator fulfils four arithmetic operations, division of integers, translation of fraction, exponentiation, multiplying on a constant factor and rootsquaring (!). In the calculator was used about 1500 transistor-magnetic units. In 1967 by this gruop of the developers was developed the calculator EDVM (electronic ten-keyboard computing machine) - first in our country calculator, automatically calculating the trigonometrical function. This calculator was designed and was released for the military topographers and was not accessible to a mass customer. 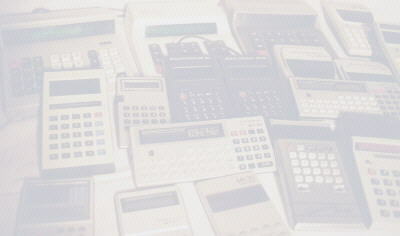 The first designed calculators had own unique titles - "Vega" (1963), EDVM (1967), "Elektronika 68 (DD)" (1968), "Rasa" (1969), "Orbita" (1969), "Ros" (1970). To the beginning of production of calculators, in USSR be not struck out yet neither nixie tube displays, nor fluorescent. For the calculator "Vega" the electroluminescent (fluorescent) display with personal segments for displaying one digit was specially developed. Probably, this is first in a world usage of a seven-segment display intended for for the displaying one digit. In western calculator Friden 130 (1963) the similar display was used, but it had not the unique seven-segment display for displaying one digit. 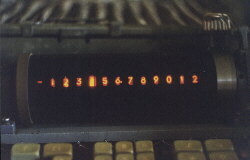 In the calculator "Rasa", which name is written by a Latinic symbols, the unique stroboscopic display was applied. The essence of the display was represented by(with) a drum which is resulted in driving by the motor, spinned with frequency 1300 turnovers one minute (see fig.). Inside the calculator the thyratrons are placed which flare during 100 us for ignition of the defined sign. In the same calculator the Reverse Polish Notation (RPN) for execution of calculations was applied. It means, that two numbers at first are entered, but only then the key with required operation is pushed. At the end of 60 years a series of the first calculators with name "Iskra" (Spark) set is developed. It - calculators a Iskra 11 (1969), Iskra 12 (1969) and Iskra 22 (1969). 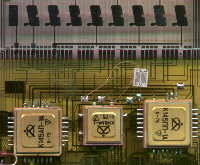 In these calculators used nixie tube display and first microassemblies (see fig.) of units under a title "MIR-10" ("Mir" mean two equal means "World" or "Peace" in Russian) were already applied. In 1971 the first calculator operating an integrated circuits - the calculator a Iskra 110 was developed. This calculator began the large series of calculators a Iskra 100-x. The calculators Iskra 110-114 intended for business application (countable workers, accounts department and other), and calculators a Iskra 121-125 - for scientific application. Iskra 1122 still is necessary to pay attention to the extremely interesting calculator. This calculator was made on the basis of the calculator a Iskra 112, but used the CRT-display is applied on the basis of the cathode-ray tube. Simultaneously on the display contents of the operating register and registers of memory are displayed. At mapping thousand are separated from each other by blank, that is very convenient for perception. By the way, this calculator was one of the most expensive released calculators with the price in 4,100 roubles (cheapest automobile in those times had cost 3,600 roubles). The first Soviet desktop calculators, which have appeared in 1971, fast have won popularity. EKVM on a basis a LSI circuit worked silently, consumed not enough energies, evaluated fast and errorfree. The cost price of chips was fast reduced, and it was possible to think of creation of the calculator of a pocket size, which price would be accessible to a wide customer. In August, 1973 the electronic industry of our country has put the task for one year to create the electronic pocket calculator on a microprocessor LSI circuit and with the liquid crystal indicator. Above this very complex(difficult) task worked group of 27 men. The huge operation was coming: to make the drawings, circuit and templates consisting from 144 thousand of points to place the microprocessor with 3400 units in a chip by a size 5х5 mm. In five months of operation the first samples of the calculator were ready, and in nine months, three months prior to a target date, the electronic pocket calculator under a title « Elektronika B3-04 » was handed over to a state commission. Already in the beginning of 1974 the electronic gnome has arrived in sale. It was the large labour victory which has shown possibilities of our electronic industry. 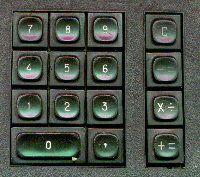 In this microcalculator a liquid crystal display for the first time was applied, and the digits were represented by white signs on a black background (see fig.). The inclusion of the calculator was manufactured by pressing a curtain, then the cover opened, and the calculator started operation. The microcalculator had very interesting algorithm of operation. To calculate (20-8+7) it was necessary to push keys | C | 20 | + = | 8 | - = | 7 | + = |. Result: 5. If the result should be multiplied,say, on three, the calculations can be continued by pressing the keys: | X | 3 | + = |. The key | K | was used for calculation with a constant. In this calculator the transparent cards with a space-wired interconnection were used. In a figure the part of card of the microcalculator is shown. The microcalculator contains four chips - 23 bit shift registers К145АP1, control unit by the indicator К145PP1, operational register К145ИP2 and microprocessor К145ИP1. In the block of conversion of power the chip of conversion of levels is used. It is interesting to mark, that this calculator worked from one battery such as AA (А316 "Quantum", "Uranium"). In the beginning 70 years habitual today language of operation with microcalculators only arose. The first models of microcalculators in general could have the language of operation, and on the calculator it was necessary to study to consider(count). Let's take, for example, first calculator of the Leningrad factory "Svetlana" of a series "С". It - calculator C3-07. By the way, it is necessary to mark, that the calculators of a factory "Svetlana" in general cost(stand) independently. Small retreat. All microcalculators in those times have received the common denotation "B3" (digit three on the end, instead of "З" character, as many considered(counted)). The desktop electronic hours have received characters B2, handheld electronic - B5 (for example, B5-207), desktop electronic with the vacuum indicator - B6, large wall - B7, and so on. The character "@" - "home appliances". Only microcalculators, designed Светлановским by a factory, have received the character "With" - Svetlana (LIGHT of a BULB of an INCANDESCENCE - for those who does not know). So, we shall take, for example, calculator C3-07. The very surprising calculator, especially, his(its) keyboard and display. As it is visible from a picture, on the calculator are combined not only key | + = | and | - = |, but also to multiply - divide | X -:- |. Try to guess, as on this calculator to multiply and to divide. The hint: the calculator does not perceive two pressing one key, one is possible only. The answer is not less surprising: to manufacture,say, multiplying 2 on 3, it is necessary to push keys | 2 | X-:- | 3 | + = |, and to divide 2 on 3, it is necessary to push keys: | 2 | X-:- | 3 | - = |. The addition and subtraction occurs similarly to calculator B3-04, that is, the obtaining of a difference 2 - 3 will be evaluated so: | 2 | + = | 3 | - = |. In some models of this calculator it is possible to meet and surprising eight-segment indicator. 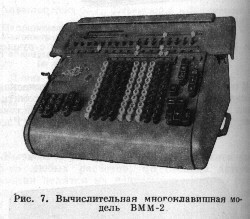 Since this model of calculators, all simple calculators Светлановского of a factory operate with numbers with the orders up to 10e16-1, even if on the display is located eight or twelve bits. If the result exceeds 8 or 12 bits (depending on model), the comma fades and on the display there are first 8 or 12 bits of number. Speaking about the language of operation with microcalculators of first printings, it is necessary to mention and calculators B3-02, B3-05 and B3-11. It - mark of old calculators such as "Iskra" of 110 series. In these calculators at calculations all bits of the indicator permanently shine. In main, certainly, zero&. It is very inconvenient to retrieve on such calculators first (and last) significant bit. By the way, in model C3-07, about which was spoken earlier, already there was an attempt to decide(solve) this problem, though and a little bit unusual way - on this calculator the zero has half of height. So, these three calculators had very inconvenient, but feature, quite explained for early calculators: the required accuracy of calculations is set at input of the first. That is, if it is necessary,say, to calculate a quotient from division 23 on 32 to within three signs after a comma, the number 23 is necessary for entering with three signs after a comma: | 23,000 | -:- | 32 | = | (0.718). So long as the operator will not push the button of reset, all subsequent calculations will be manufactured with three signs after a comma, and the comma in general does not go anywhere more. It, by the way, also is named " as the fixed comma ", and later calculators, in which the comma is already transferred on the display, then were named " from a floating point ". Now, in a terminology there were changes, as a result of which from "floating point" mappings number with a mantissa at the left and order on the right now are named. In one year after development of the first pocket microcalculator B3-04 more perfect models pocket MK have appeared new. It - model B3-09М, B3-14 and B3-14М. These calculators were made on one chip of the processor К145ИК2 and one chip of the generator of phases. The calculator B3-09М at the left is shown, in the same tank is made and B3-14М, on the right - B3-14. On these models there was already "standard" language of operation on calculators, including calculations with a constant. These calculators already could work both from a power supply unit, and from four (B3-09М, B3-14М) or three (B3-14) of units such as АА. Though these calculators are made on one about the same chip, but had different functionalities. 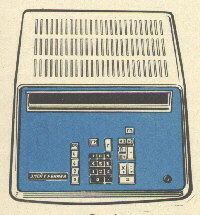 And in general, "уBирание" of different functions was inherent in many models of the Soviet microcalculators. For example, the microcalculator B3-09М did not have sign of calculation of the square root, B3-14М is not skilful to evaluate percents. Feature of these simple calculators was that the comma borrowed(occupied) separate bit. It is very convenient for fluent reading of the information, but thus the last sign bit disappears. For the same calculators before the beginning of operation it is necessary to push the "C" key for clearing the registers. Following huge step in a history of development of calculators became appearance of the first Soviet engineering calculator. At the end of 1975 in the Soviet Union the first engineering calculator B3-18 was created. As wrote in this occasion a magazine " a Science and Life " 10, 1976 in paper " a Fantastic electronics engineering ": "... This calculator has passed a Rubicon of arithmetics, his(its) mathematical derivation has stepped in trigonometry and algebra. " The electronics Engineering B3-18 " knows how instantly to erect in guadrate and to extract the square root, in two receptions(tricks) to erect in any degree in limits of eight bits, to evaluate reciprocals, to evaluate the logarithms and antilogarithms, trigonometrical functions... ", ".. .. When see, how the computer, which just instantly added huge numbers, spends some seconds to fulfil any algebraic or trigonometrical operation, involuntarily reflect on that large operation, which goes inside a small box, before on its(her) indicator the result " will be lighted. And is real, the huge operation was done. In a uniform chip by a size 5 х 5,2 mm were possible to contain 45000 transistors, resistors, capacitors and explorers, that is half-hundreds TV sets of that time have pushed in one section of an arithmetic writting-book! 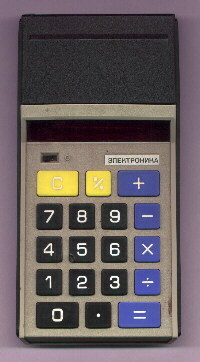 However, and the price of such calculator was considerable - 220 roubles in 1978. For an example, the engineer after termination(ending) institute in those times received 120 roubles per one month. But the purchase cost that. Now it is not necessary to think how to not bring down a shade slide of a slide rule, it is not necessary to care of an error, it is possible to desert on a shelf of a table of logarithms. By the way, in this calculator the key of the prefix "F" function for the first time was applied. Nevertheless in a chip К145ИP7 of the calculator B3-18 it was not possible completely to contain everything, that would be desirable. For example, at function evaluation, in which the expansion in a series Theilor was used, the working register was cleared, therefore the previous result of the operation was cleared. In this connection it was impossible to manufacture the continiouses of calculation, such as 5 + sin 2. For this purpose at first it was necessary to receive sine from two, and then only to add to result 5. So, the operation is done large, the large efforts are spent, and as a result has appeared good, but very dear(expensive) calculator. That the calculator was accessible to mass layers of the population, the solution was accepted on the basis of the calculator B3-18А to make cheaper model. To not devise a bicycle, our engineers transmit on the easiest paths. They have taken and have removed the key of the prefix "F" function from the calculator. The calculator has turned in usual, has received a title "B3-25А" and became to accessible wide layers of the population. And only developers and repairmen of calculators knew secret of alteration B3-25А. At once after the calculator B3-18 together with the engineers from GDR the calculator B3-19М was released. In this calculator the return Polish notation " was used so-called ". The first at first is typed, then the Enter key of number in the stack, then second, and only after that - required operation is pushed. The stack in the calculator consists of three registers - X, Y and Z. In the same calculator input of exponent and show of number in the format from a floating point (with a mantissa and order) for the first time was applied. In the calculator the 12-bit indicator on red light-emitting diodes was used. In 1976 other very power engineering calculator - C3-15 has appeared. This calculator had heightened accuracy of calculations (up to 12 bits), worked with the orders up to 9, (9) in 99 degrees, had three registers of memory, but most remarkable - worked with algebraic logic. That is, to calculate under the formula 2 + 3 * 5, it was not necessary at first to evaluate 3 * 5, and then to result to add 2. This formula could be written in "natural" sort: | 2 | + | 3 | * | 5 | = |. Besides in the calculator the brackets up to eight levels were used. Still this calculator - unique(sole) calculator, which together with the desktop brother MK-41 had the key /p/. This key was used for calculations under the formula sqrt (x^2 + y^2). The calculator C3-15 - was developed since 1974 at involvement of the Leningrad scientists. In this calculator the algorithm "CORDIC" was applied for calculation of elementary functions. Mathematical аPPарат was offered by the professor V. Baykov, brought in the large contribution in development of algorithm CORDIC (http://devil.ece.utexas.edu/baykov/index.html). 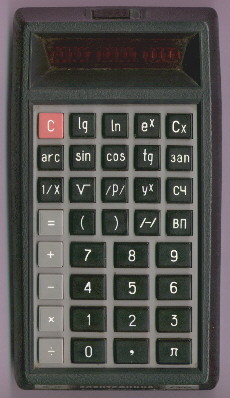 In 1977 the chip К145ИP11 was developed which has caused the whole series of calculators. Very first of them was the very known calculator B3-26 (in a figure on the right). As with calculators B3-09М, B3-14 and B3-14М, and also B3-18А and B3-25А have done without by an identical image - by deleting some functions. On the basis of the calculator B3-26 the calculators B3-23 with percents, B3-23А with the square root, B3-24Г with memory were made. By the way, the calculator B3-23А subsequently became the cheapest Soviet calculator with the price all in 18 roubles. B3-26 soon began to be named MK-26 and his(its) summary brother MK-57 and MK-57А with similar functions has appeared. Светлановский the factory also has pleased with the model C3-27, which, the truth, has not got accustomed, and she(it) soon was replaced by(with) very popular and cheap model C3-33 and its(her) development - MK-33. One more direction in development of calculators became engineering B3-35 (MK-35) and B3-36 (MK-36). B3-35 differed from B3-36 by more simple design and cost on five roubles more cheaply. These calculators knew how to translate degrees in radians and on the contrary, to multiply and to divide numbers in memory, and also to evaluate factorial. Very interestingly these calculators evaluated factorial - simple exhaustive search. On calculation of maximum value of factorial in 69 on the calculator B3-35 there leave more than five seconds. These calculators were very popular in us, though had, on my sight, some disadvantage: they displayed on the indicator equally so much significant digits, how many about it is told in the instruction. Usually them five - six for transcendental functions. On the basis of these calculators the desktop variant MK-45 was made. By the way, many pocket engineering calculators have the desktop brothers. It - calculators MK-41 (C3-15), MKШ-2 (B3-32), MK-45 (B3-35, B3-36). The calculator MKШ-2 - unique(sole) "school" calculator released by our industry, except for large demonstration, about which will be told below. MKШ-2 this calculator feeds from the school network 42 In., as well as the calculator B3-32 (in a figure at the left) is skilful to evaluate the radicals of a quadratic equation and to discover the radicals of a set of equations with two unknown. On design the calculator B3-32 is completely identical to the calculator B3-14. Feature of the calculator except for circumscribed above - all inscriptions on keys are fulfilled on foreign standards. For example, the key of record of number in memory was meant not "P" and not " x- > P ", and "STO". Call of number from memory - "RCL". Despite of possibility of operation with numbers with the large orders, on this calculator the eight-bit display, same as well as in B3-14 was used. It turned out, that if to map number with a mantissa and order, on the indicator five significant digits find room only. To decide(solve) this problem in the calculator the "CN" key is used. If, for example, result of calculations is the number 1.2345678e-12, on the indicator it will be mapped as 1.2345-12. Having pushed | F | CN |, we see on the indicator 12345678. The comma thus dies away. 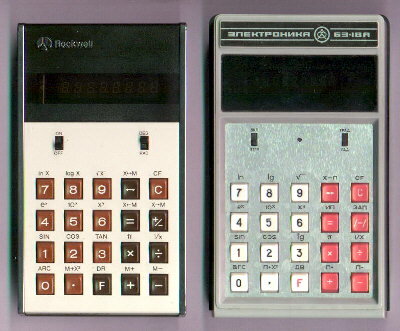 At the end of 1977 was developed, and in the beginning of 1978 the first Soviet programmed calculator B3-21 (in a figure on the right) has acted(arrived) in sale. It was one more large step forwards. 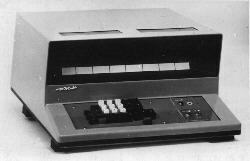 Before the people had on many times to iterate calculations, in calculators there was a maxima three registers of memory. Possibility itself now has appeared to write programs and to store some numbers in memory. The term " the programmed calculator " called(caused) Bлагоговение and some shiver in a voice. It was the very dear(expensive) calculator - it(he) cost of the whole 350 roubles! Soon calculator was awarded is familiar qualities. The first models of calculator B3-21 were released with the indicator on red light emitting diodes. The comma borrowed(occupied) separate bit. Then the indicator have changed on green катодо-luminescent, because of what it(he) began to work on 20 % more slowly. The calculator works with return reverse Polish notation, that is at first two numbers are entered, and then the operation is entered. After input of the first it is necessary to push a up arrow . . Except for two operational registers X and Y the calculator has the ring stack consisting of six registers. The stack of numbers is connected to the register X. For ring moving of numbers in the stack the special keys of moving of numbers in the stack - clockwise and against -hour are used. Except for the ring stack in the calculator seven registers with numbers from 2 up to 8 are stipulated. The calculator has two prefix keys - F and P. The key F is prefix for operations designated by black colour, key P - designated red. The prefix keys also are used for record and extract of numbers from the registers. For record the key P, and for reading - key F is used. But I have not told about key feature of the calculator B3-21 - ability to program! In the calculator there are 60 steps of the program, and the addresses are written modulo six, that is the addresses go in the following order: 00, 01, 02, 03, 04, 05, 10, 11 and so on. Each key has the opcode. The calculator has functions of unconditional branch, transition to the subroutines, and also transitions on a condition. The keys of branching (transitions) use two storage locations of the calculator - one cell borrows(occupies) an opcode, and another - jump address. The required jump address turns out, outgoing from the key code, which is pushed after pressing the key of transition, plus 1. For example, certainly to proceed(pass) to the address 33, it is necessary to push keys BP and 3 (code 34). The codes of operations took from the table. The first programmed calculator at once became very popular in the country. Now user could not only write complex(difficult) programs, but even to play in games with the calculator. It was a unprecedented innovation! Beginnings to be released the literature on a software technology on the programmed calculator. At the left in a figure - very popular book of those times devoted to games and useful programs with usage of the calculator B3-21. The Appearance of the programmed calculator B3-21 has allowed even to organize production control. The desktop variants of this calculator - MK-46 and MK-64 (figure on the right) were released. It were the large desktop calculators having on a back part tanks special plugs. The additional register 9 was entered, in which the code of experiment " was written, so-called ". In these calculators the data entry both from the keyboard, and from peripherals (sensors, analog-to-digital converters and other is possible(probable). ), they can realize a control of tolerance values of entered datas and to print datas and results of their processing through the peripheral. MK-64 differs from MK-46 by presence of the built-in digital-to-analog converter. Many calculators MK-64 were placed(installed) in studies of physics of special physical and mathematical schools, as they could, say, meter power from the battery. The first programmed calculators B3-21, MK-46 and MK-64, though worked on the program, but had only two operational registers X and Y, and the operation with the ring stack was very inconvenient. And, in 1980 on change of the calculator B3-21 the programmed calculator B3-34 in the price 85 roubles has come. It was one more step forwards! He(it) had stack consisting of four registers, 98 steps of program memory, 14 registers of memory instead of seven for B3-21, and most important - possibility of organization of cycles and operation with index registers. With the calculator began to work - one pleasure. Clones B3-34 - MK-54, made in more beautiful design soon have appeared, and costing on 20 roubles is cheaper at the expense of usage of power supplies of other type. Desktop variant - MK-56 also was developed. One behind another the known popular scientific magazines began to learn(teach) to work with the calculator. It - magazines " a Science and Life ", "Engineering - youth" and " Chemistry and Life ". In " to a Science and Life ", since October, 1983 the special section " the Man with the calculator " has appeared, where it was told as to work with B3-34, and also the great many of useful and game programs was reduced. The magazine " Engineering - Youth ", starting in 1985 at first has lead(carried out) course of programming on B3-34 under a title " the Calculator - your assistant ", and then has organized " Club of Electronic Games ", in which the most fascinating fantastic stories " the True Truth " and " Path to the Earth " were printed, where the readers were offered itself "to master" engineering of "landing" on a lunar surface and to realize flight from the Moon on the Earth by the ship, not fitted to such flights, of local lunar lines. The schoolboys and adult users of the calculator with impatience expected next number of "Engineering - youth" to continue flight to the Earth. The calculator works on return reverse Polish notation, that is at first first is entered, the key is pushed, the second is entered and the key with the necessary operation is pushed. That is, to multiply 2 on 3, it is necessary to push keys: (result - 6). For storage of operands the stack consisting of four registers - X, Y, Z, T is used. At input of number after obtaining result and at extract of number from the register of memory (0.. 9, A.. D), contents of the register X, which is mapping of the indicator, are shifted in the register Y, value Y - in Z, and Z - in T. At execution of operations as operands are used, in main, register X and Y. In the mode of programming the code of each command borrows(occupies) one storage location. Commands of branching (transitions, cycles, the conditions) borrow(occupy) two cells. One cell - opcode, second - jump address. As against B3-21, the jump address is set through number keys, instead of through input of the operation with the necessary code. For example, to enter the branch instruction on the address 33, it was necessary to enter | BP | 3 | (key 3 there corresponded(met) the code 34). In the calculator B3-34 now it is necessary simply to enter | BP | 3 | 3 |. Though now also it was necessary to bring in on one key more, but it is not necessary to be compared with opcodes under the tables. олее is detailed how to work with the calculator B3-34, is circumscribed on special страничке, devoted operation with B3-34, which is located here. However, most interesting in calculators B3-34, and his(its) clones - presence of the not documentary possibilities, which helped not only in writing programs, but also to shape the special videomessages. The not documentary features in these calculators has appeared so much, that deserve writing of separate paper. About the not documentary possibilities B3-34 and his(its) clones it is possible to familiarize here. The calculator B3-34 and his(its) clone MK-54 and MK-56 of steel so popular, that the developers from the Kiev factory "Chip" have decided(solved) to continue this line of calculators and in 1985 have released new models MK-61 and MK-52. In them one register of memory is added, there were 105 steps of program memory and ten of functions is added. 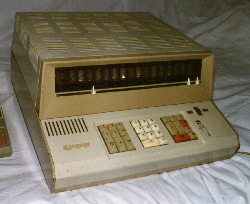 The calculator MK-52, besides had memory on 512 cells, which was not cleared at turn off of power supply, and in which it was possible to write both program, and datas. In the calculator MK-52 there was also special plug for connection of available units with programs released under a common title BRP (the block of the extension of memory). At development of blocks BRP the developers again have killed at once two rabbits by one shot, inbonding in the block a matrix with two suites. Having placed(installed) a cross connection,say, in a rule(situation) 1, we obtain the block BRP-3 with a mathematical suite, and rebonding cross connection on a rule(situation) 2 - the block BRP becomes astronavigation BRP-2. The warranty, truth, on the block thus was lost, as it was necessary to turn off the screw with a seal. About it was told in one of numbers " Sciences and Life ", where one of the readers has informed about it with edition, to which in turn about it has told one of the developers from "Chip". I present, that was then with this developer. By the way, the calculator MK-52 flied to space by the ship " Union ТМ-7 ", where it(he) was supposed to be used for account of a trajectory of landing(planting) in case the on-board computer will deteriorate. The first calculators consumed a lot of energies from batteries, which operation sufficed from force at two hours of an off-line operation. 220 volts under a hand happen not always, and without problems to buy batteries it was possible only in large cities. Therefore engineers - developers have begun to develop calculators, which there is not enough of energy from batteries. Liquid crystal displaies by then were already struck out which differed by the reduced энерго-consumption. The second calculator on liquid crystals after B3-04 became the calculator B3-30 (in a figure at the left), designed in 1978 and consuming 8 milliwatts (for matching, the calculator B3-26 consumed 600 milliwatts). In this calculator there was a function, unusual for the Soviet calculators, of calculation of reciprocal of number available practically in all modern simple calculators. To calculate 1/5, it is necessary to push | 5 | -:- | = |. In one year the calculator B3-30 has replaced B3-39, in which the new lowlevel chip was used. The power consumption has decreased in eight times and has made only one milliwatt. In this calculator already it was possible to do without a converter of power. In one year, to the Moscow olympiad of 1980 the calculator MK-53, having onboard hours with an alarm clock and stop watch was released. In this calculator it was required on one battery less, than in B3-39. It became possible(probable) at the expense of usage of even more lowlevel chip К145ВВ3-2, which besides became "packageless". New mark in a calculator-building also became appearance of the calculator with power supply from solar cells MK-60. In common, the usual calculator, has one register of memory, except for solar batteries anything in it(him) singular is not present. The engineering thought too in place . did not stand, and, deciding(solving) the task of microminiaturization, in 1979 is developed new supersmall, but very clever calculator B3-38. He(it) included all last reachings of microelectronics. His(its) sizes were smallest - 91х55х5.5 mm. It(he) is skilful not only to be engineering, but also manufactured statistical accounts. The calculator had two prefix keys - F1 and F2. The similar calculator soon has appeared, but with sizes is larger - MK-51. Soon it(he) became very popular, though he(it) had essential disadvantage - power switch, which all time badly switched on. It was that our engineers have guessed to make the mechanism of inclusions consisting of a semicircular shade slide, which closed tracks of printed wiring on card. Certainly, in due course tracks окислались or were cleared, and the contact became bad. In these calculators a method of calculation of elementary functions on a method " digit behind digit " for the first time was applied which became has replaced an expansion in a series Theilor and became the actual standard almost for all modern calculators all over the world, except for as for us. In two words, method " digit behind digit " is possible to attribute(relate) both to iterative, and to tabulared. It(he) is characterized by a simplicity of execution of operations (algebraic addition and shift), significant coincidence of algorithms for different functions and, most important, high enough speed and accuracy by calculation. The error of calculations at 8-bit argument makes all + - 1 in the seventh - eighth bit. And, at last, one of the latest models among engineering calculators became the calculator MK-71 with power supply from solar cells. It(he) as a matter of fact is prolongation(continuation) of a series B3-38 and MK-51. In this calculator, as against B3-38 and MK-51, the algebraic logic of calculations, same as well as in C3-15 is used, there are five levels of brackets, possibility of operation with common fractions and to represent result of calculations in degrees, minutes and seconds, there are hyperbolic functionses and mechanism of roundoff of result to required accuracy. Besides this calculator - ten-bit. In the beginning 80 years become of PCs ever more. In 1983 there is a first Soviet PC "Agat" with the processor 6502, at some schools start to teach the programming languages. In 1986 there is a first Soviet calculator with the programming language of "BASIC" - "Microcomputer" Elektronika MK-85 ". There is it(he) not cheaply - 145 roubles, but all the same Electronics engineering " with Moscow and Leningrad at once is swept away from counters of firm shops ", it is necessary to it(him) to appear. Only by 1988 it(he) can quietly be bought in shop. It - not without puprose - in the calculator is " of a BASIC " - programming language of the present computers! MK-85 Was released in two variants - with kilobyte of memory (MK-85) and with six (MK-85М). The calculator had a feature - worked with numbers, for which the orders reached(achieved) + - 4096 degrees. The truth to take sine from number with the order close to 4096, could reduce not only in hangup, but also to miss already of gated in programs. The programs, by the way, were not cleared from memory of the calculator after his(its) turn off - too novelty. In the usual mode the calculator works about - о-о-чень slowly. So for example, for calculation of sine from number 3 it is required to it(him) of the whole 3.5 seconds. The calculator can be translated about the mode " of the accelerated calculations ". For this purpose at the moment of his(its) inclusion it is necessary to push the key "+". Then it(he) considers(counts) very fast. Same sine it(he) "takes" for 0,5 seconds, but thus the batteries literally "decay" on eyes, and they very soon need to be changed. Such mode of operation is recommended by operation from the external power supply. In the calculator there is a 16-bit indicator, and in one string(line) up to 63 characters can go in. The input up to 10 programs of the user is stipulated, and the gated in program can be debugged in the mode of debugging. Besides in the calculator there are 26 registers of memory, which number can be enlarged at the expense of decrease of memory for programs. It is very interesting, that in such perspective calculator the elementary mathematical functions are evaluated by an expansion in a series Theilor, instead of on a method " Digit behind digit ", that is a little strange. Though much strange can become completely clear, if you will read up this paper up to the end. And, at last, completes our historical digression about a world of calculators - super-calculator MK-90 - child of the Minsk factory "Chip". I have not enough of information on this calculator owing to absence it(him) in my instruction. I shall tell only, that it is the calculator with a BASIC, and large graphics screen. It(he) has the 16-bit processor compatible to Elektronika 60, RAM - 16 kilobytes, ROM - 16 kilobytes (user is accessible 11824 bytes). The display - 120 х 64 points (8 strings(lines) till 20 characters). On it the evolution of calculators is completed, as though we would like it. The Minsk factory "Chip" continues to release MK-90, releases some more simple calculators of a series MC. Our Russian factories, similar, completely have minimized production of calculators. The import models for a long time have escaped far forwards. For them norm became presence of 32 kilobytes of memory, large graphics, or even the color display, link with the computer and decent speed. To rare models of calculators it is necessary to attribute(relate) not only very old models of calculators, which for a long time already have demolished on a dustbin, and models, which were released only by trial batches, or which were very fast removed from production. In main, I have not enough of information on such calculators, sometimes even the information is obtained only from a mention in the books. All first Soviet calculators fulfilled with usage of transistors, ферро-transistors or microassemblies - very rare. From calculators of a beginning 70 years very rare model - Iskra 1122 with the CRT-display. The first rare model among pocket and later calculators - model B3-18. At once after its(her) release has appeared B3-18А, and B3-18 is removed from production. Same it is possible to tell and about B3-19 (B3-19М). The experimental batches of calculators with the red indicator as light-emitting diodes were released. It is models B3-09, B3-26А, B3-36А. Very rare model - unique(sole) Soviet calculator with a printing station - MK-40, which was only in pilot production and never acted in mass sale. Also I want to mention and about MK-47. This calculator is made in similar tank with B3-21, and allowed to write programs of the user to magnetic cards. Among late models by trial batches in 1982 (!) The calculator " Elektronika SP " was released which represented a pocket dictionary - translator. It(he) stored in memory till 1000 words from Russian, English and German languages. Apart from it in it(him) there was a calculator, review of all words starting from any character, call on the indicator of one of 52 completed or unfinished phrases, and also call of words and phrases on 11 themes. The calculator had 15-segment 16-bit indicator and worked only from five volts. This device was made on the basis of a monolithic microprocessor К1801ВЕ1 and had 64кBит ROM such as К596РЕ1. It is a little about errors and features. Taking into account specificity of development of the Soviet calculators, including geopolitical aspects, can become is clear, that if our developers developed the calculator, not leaning(basing) on results of level-by-level scanning of chips of import clones, they permanently brought in any snap to their operation. It were both error of calculations of calculators, and interesting finds. In the set of calculators of a series B3-26 (B3-23, B3-24Г, MK-57) the square roots from negative numbers were evaluated. The radical from -4 was equal -2. In the calculator B3-32, the developers, having seen, that on the indicator are the not involved point at the left, have decided(solved) her(it) to involve. For this model the point at the left lights up at pressing the key. Have pushed - lights up, have released(let off) - dies away. More - anything. In the calculator B3-21 the developers have included the function , which result in the register Y sine of argument, and in the register X - cosine was located with. By simple division we obtain a tangent. Very conveniently. However, in first printings of these calculators the error was watched: at addition of number containing in a mantissa seven "9", and in the eighth bit, which is not displayed - digit, large four, there is an error. In these models if to fold 9.9999999 and 10 it turns out 120. At execution of complex(difficult) operations like sine one of the registers of the ring stack could deteriorate. For check after inclusion of the calculator it is possible to type | 2 | P | sin | P |, |. If on the indicator lights up 1. -00, the calculator has such error. Well, and some models irregularly transferred (more precisely, did not transfer) to the subroutine, if the operator PP is brought in cell of program memory with the address 55, 65, 70, 80, 91 and 92, and the operator is fulfilled, which code is equal to the pointer of transition to the subroutine. Slightly not clearly, but if to the address 55 costs(stands) | PP | 9 | 9 | C/P |, instead of proceeding(passing) to the address 93 (key code | 9 | - 94), the calculator will bring in the register X number 99, it can call(cause) easy bewilderment owing to nervous failure for the man, which is sure, that has written the program correctly. The curious users can find in the calculator MK-71 one very remarkable feature. She(it) is coupled to switching of the switch of degrees - радианов-градов in a midposition - between degrees and radians or between radians and градами. Thus the calculator passes in a very unusual mode of operation reminding operation with the calculator MK-51. First, now numbers in the calculator have a mantissa of length 8 instead of ten, though the missing bits are stored in memory, but are not visible. Secondly, some control buttons have other value! The key with the map of degrees now evaluates return value of number, in a combination to the key F - factorial. The key 1/x - switches a way of calculation of trigonometrical functions (degrees - радианы-грады). On the indicator they are mapped accordingly by tags "F", "P", "K"! In a combination to the "F" key the key 1/x now enters the mode of statistical calculations. The "hyp" key now enters the information in degrees, minutes and seconds, and back in a combination to the "F" key. For indication of number were in memory, mode of the "F" key and the calculations with a constant are used segments of the most left bit. Well and, certainly, all known B3-34. This calculator has the great many of errors and features in operation. I shall point only some errors, which in one book were called as features, which "... Are a consequence not of errors of the developers of the calculator, and their attempts to find the compromise between the requirements of a software and simplicity of a construction ". In a programmed mode of operation the functional operators before the operator /-/ of change of the sign are not fulfilled. After execution of the subroutine ended by some operators, instead of the operator В/0, the operator, following it(him) is fulfilled. Such "feature". The operator x^Y was fulfilled incorrectly at some values of operands. For an example it is possible to enter | 5 | 5 | 5 | 5 | | Х | 4 | | F | X^Y|. If is highlighted 39.062487, the operator x^y is evaluated irregularly. These - that the errors in a consequence were corrected, but there were errors of exponentation of negative numbers in the whole degree, the calculator MK-61 and MK-52 considered(counted) a zero as largest in a world by number at function evaluation of finding maximum of two numbers | K | max |. To not devise a bicycle, some models of the Soviet calculators were obviously borrowed from western clones. It is already difficult to place(install), how there was a borrowing - level-by-level scanning of chips, industrial espionage or purchase of the "know-how". Below I shall try to reduce only list of the Soviet calculators "very similar" to western. To Guy Ball: for publication of photos of western calculators it is necessary to receive permission from their writers. Elektronika 68 (ДД) vs Sharp "Compet 20". Elektronika B3-04 vs Sharp EL-805. 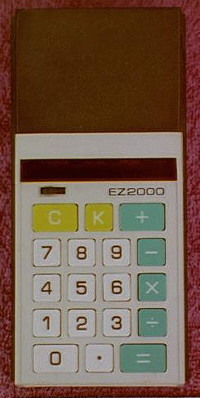 The large series of calculators had design similar with General EZ2000. Elektronika B3-36 used design from Rockwell "The 22K"
Please visit my site devoted to collecting of calculators: http://www.geocities.com/SiliconValley/1061/calcolle.htm.